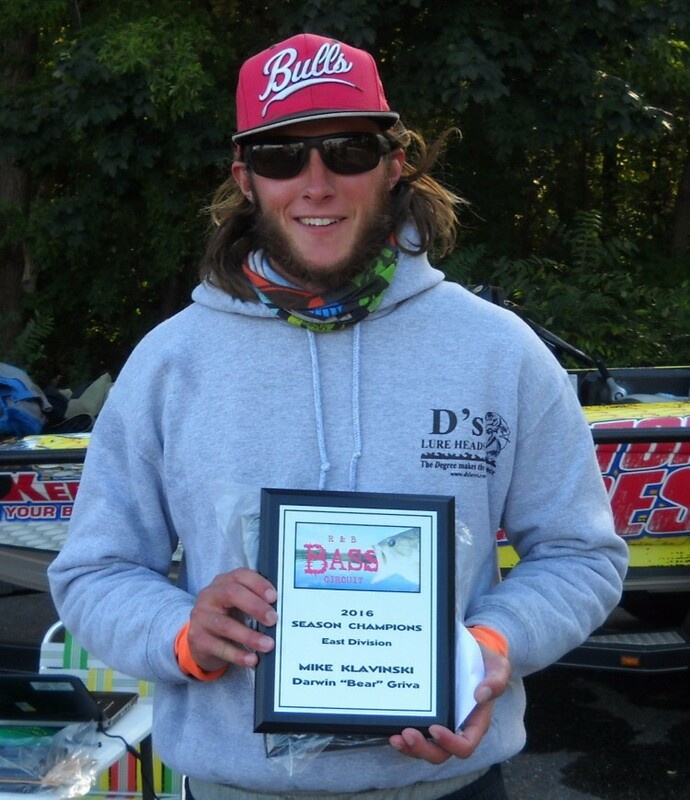 1st Place: For the second year in a row, a Season Champion won the R & B Bass Circuit Classic. That should not surprise, but before the 2015 Classic at Coldwater Lake, no Season Champion squad had ever finished in the money, let alone won. Bear Griva and Mike Klavinski know that well. 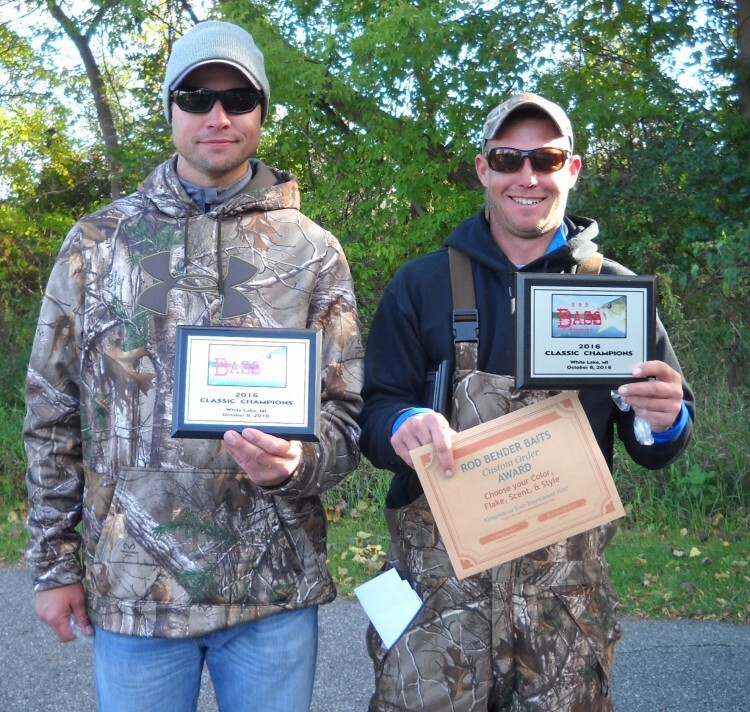 After being crowned Season Champions in 2014, they went to Gun Lake and failed to catch a single keeper; they remembered that feeling from Gun Lake, and then exorcised it on White Lake. competition, that was the end to all shenanigans. But, ironically, shenanigans are exactly what led to a $2,250 payday, and the shenanigans began the previous day. Griva and Klavinski armed themselves Saturday morning with pink worms and beat the best of the R & B Bass Circuit with it. Just thirty minutes into the tournament Klavinski landed the big bass of the tournament, a 5.78 pound monster (the sixth heaviest in R & B Bass Circuit history), with his pink worm, but their patience was challenged once more, “At 11:30 we still only had one fish in the livewell,” Griva recollected, “but then Mike caught three fish in five minutes with his pink worm.” That prompted Griva to replace his watermelon colored worm with a pink one, and on one of his first casts he caught a 3.5 pound largemouth with it. From that point forward it was carpe diem. They rotated through four sweet spots along a breakline for the last four hours, and on each pass caught 1-3 keepers, landing 15 total keepers on a day that saw 15 teams fail to catch a single one. There was no denying the effectiveness of the worm either, “At the end of the day we fished in an area with a lot of pressure, and we caught nearly a limit behind a number of boats,” Griva confessed. A 17.39 pound limit is the seventh heaviest in R & B history and won them $2,000. The big fish won them another $250, and it gets better. For the third time this year they fished from a boat with a KeelGuard, thus qualifying for another $150 with their incentive program. Their pink worms won them $2,400! Add the $350 they scored for winning the East Division, and they took home $2,750. After winning the points in 2014, the champions were absent from the R & B in 2015. Because of that, perhaps they flew a little under the radar with their return in 2016, but what about 2017? With expected growth next year for both divisions, an enormous bullseye is now on their backs. Enjoy the well earned success Mike and Bear, but keep plenty of pink worms handy for 2017. Mike Klavinski with his KeelGuard. That fish bit aggressively, and it came right after swapping out to a heavier jig. The team had been throwing ¼ ounce jigs in the weeds for a more finesse offering, but the aggressive bite came after switching to a ⅜ ounce model. From that point, their game plan was set. “We had a 100 yard stretch between 7-12 feet of water that we knew was holding fish, and we spent our whole day there,” added Cook. 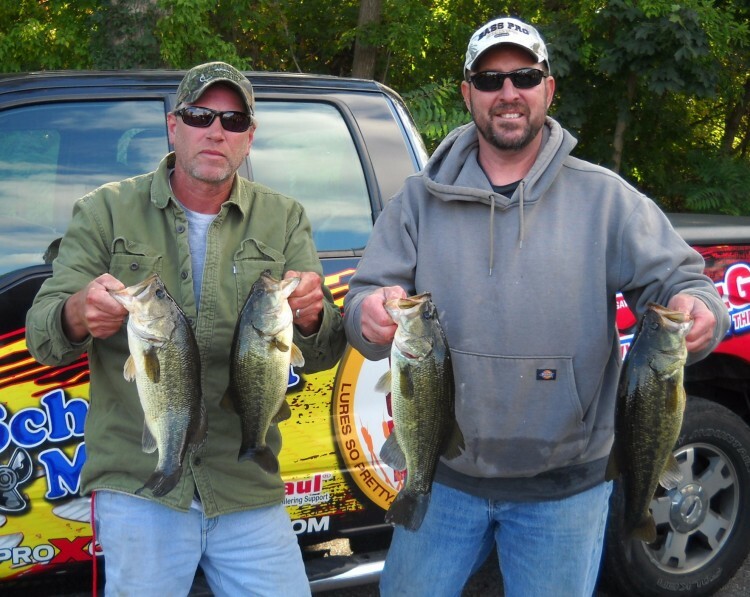 Armed with ⅜ ounce jigs the duo “ripped” them through the weeds to coax 14 keepers to the boat and ended with a 14.27 pound limit of largemouth. Cook acknowledged they were never able to determine what was unique about their area, but it was in the “windy stuff. 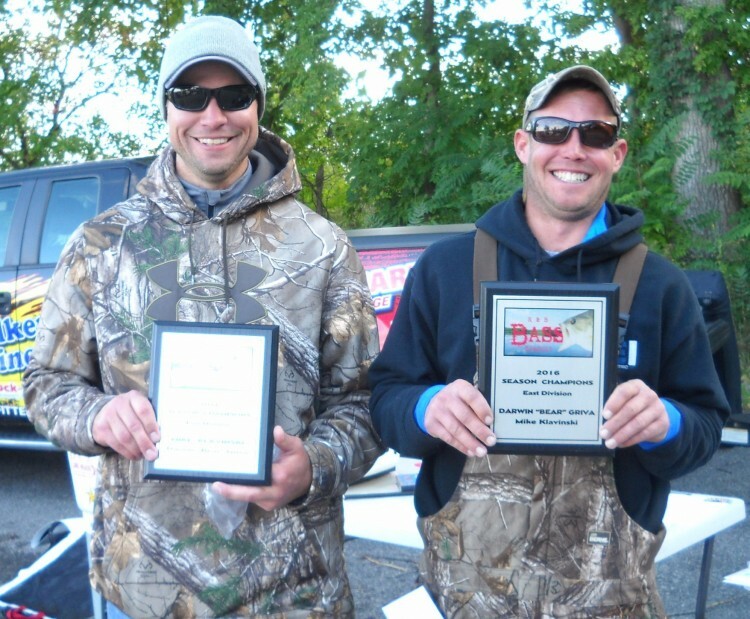 That 36 volt trolling motor came in real handy!” Their discovery won them $1,200. 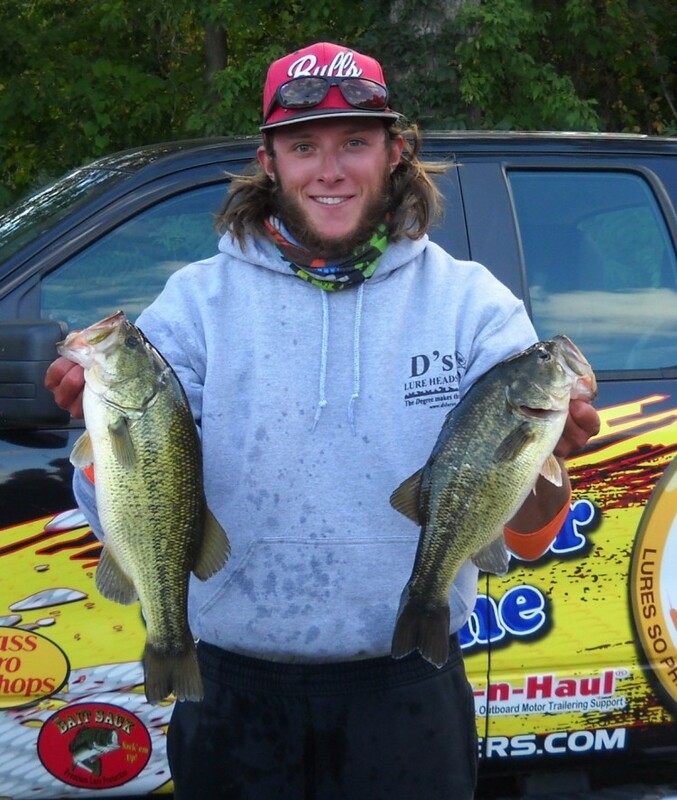 “We knew it was tough fishing,” Marquardt explained, “plus, each time we talked about moving, we would catch a fish. Furthermore, I had hurt my back (Marquardt was at the chiropractor during the first attempt to set up this interview), and I knew I would be worthless in those waves!” The point of choice had a combination of wood and weeds present. They sat in six feet of water giving them access to both shallow and deep water. Most of their fish came by deadsticking a shaky head with a variety of worms, but a pair of their nine keepers were victims of a crankbait and jerkbait. Their intuition paid them $1,000. 4th Place: Gut instincts is an apparent theme from the White Lake tournament. 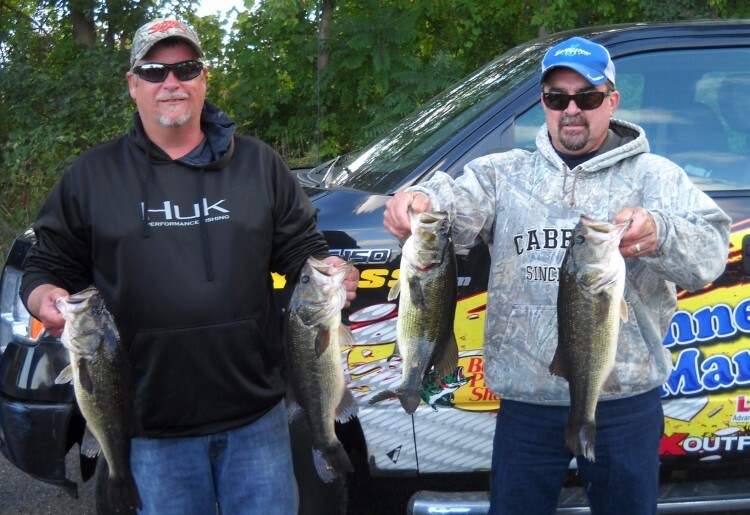 Despite finding a strong bite in shallow water with spinnerbaits the day before the event, Jim Betts and Robert Hayes knew that bite would fizzle and abandoned it. “We believed the wind would pull the fish out deeper,” Betts admitted. They were right. Rotating through the three cuts produced nearly 20 keepers with ⅜ ounce green pumpkin and black/blue jigs. All three spots were between 9-14 feet deep that coincided where sand was prevalent. 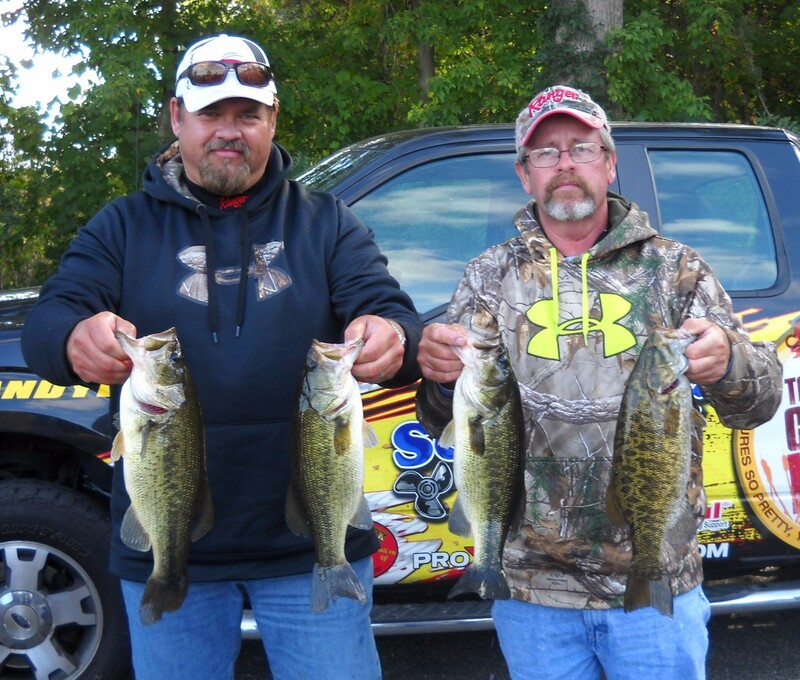 Their 14.00 pound limit won them $700. 5th Place: Kyle Kaser (right) spent Thursday on Kentucky Lake with his brother, Michael, and then drove all day Friday to participate on White Lake by himself Saturday (Michael is a student at Indiana University and was dropped off on campus). Despite these odds, one half of the West Division Season Champions still managed a 13.54 pound limit to win $600. 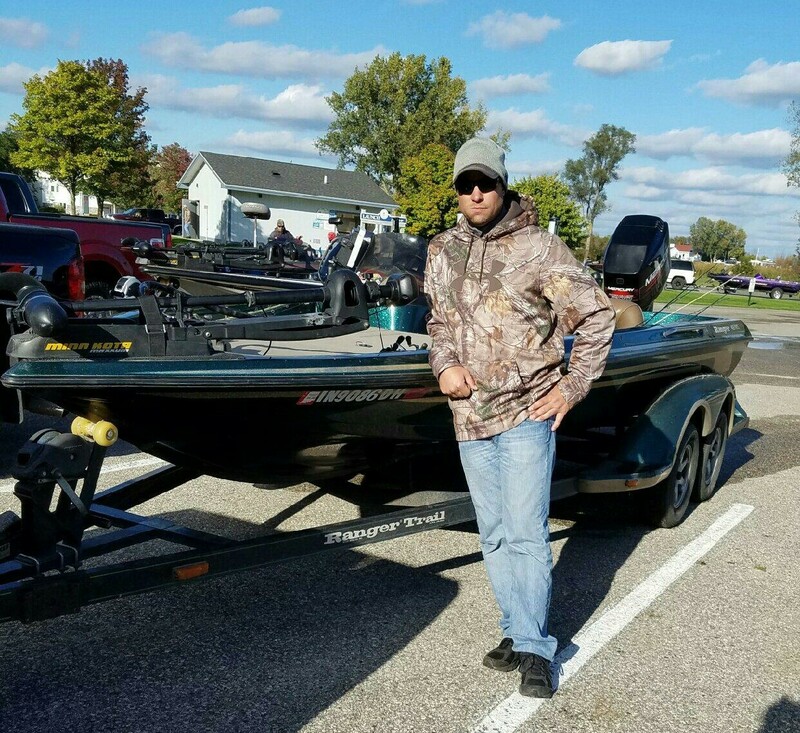 The previous week Kaser competed in a tournament on White Lake and had success tossing frogs and buzzbaits in shallow water, but conditions were not favorable for a repeat, so he adjusted. He set up on a point in the wind and threw a double willowleaf spinnerbait. After quickly boating two solid keepers, which wound up being his two biggest, he faced difficulty landing another. Noticing a mudline, he swapped out that spinnerbait for one with double Colorado blades and finished his limit by 10:00. It was not as easy as it sounded, though. He said, “I had to crank up the outboard motor whenever I drifted past the point to start the drift over.” He did this countless times. Mike Klavinski and Bear Griva were presented plaques and $350 for leading the West Division after six tournaments. 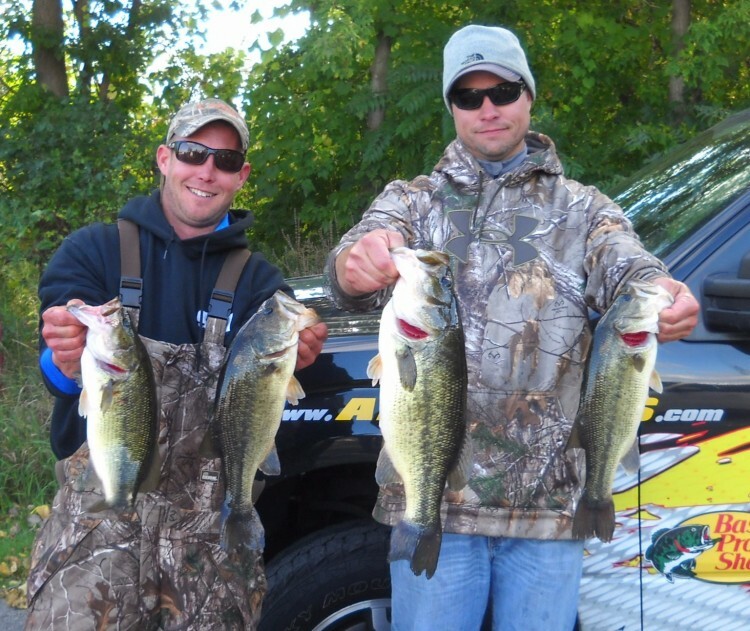 The 2014 R & B Bass Circuit Season Champions dominated the division by winning three of the six events. Their 307.32 points are the second most in R & B History, while their 77.32 pounds is also the second highest. They won three East Division tournaments on their way to a victory by more than 31 points. ​​Kyle (pictured) and brother Michael Kaser won the closest race in R & B History. Speaking of records, their 276.64 total points are the third highest total ever. 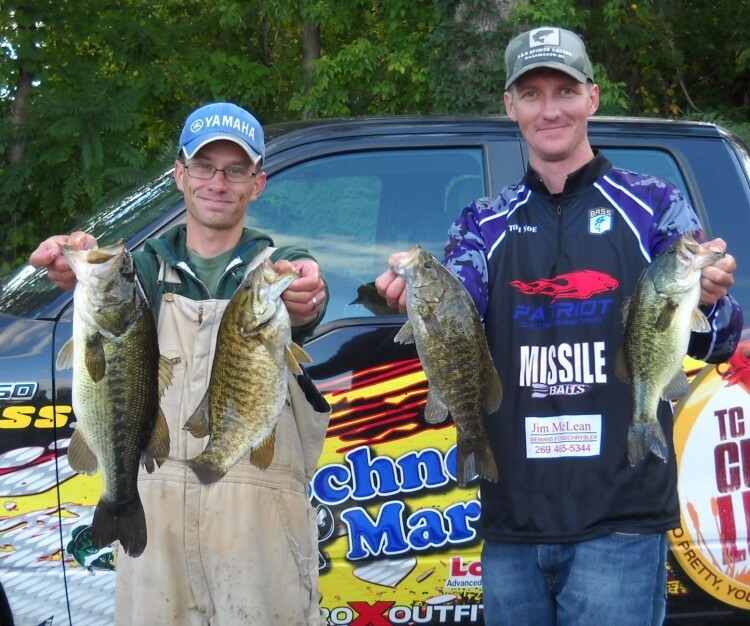 Going into the final event on the Randall Chain, five teams were within five points and the brothers dominated that event by nearly 6 pounds to claim the title. This was their second victory of the season. They were awarded plaques and $250. Just how rough was it? Look at the white water in the background. Those are actually waves rolling over the breakwalls. 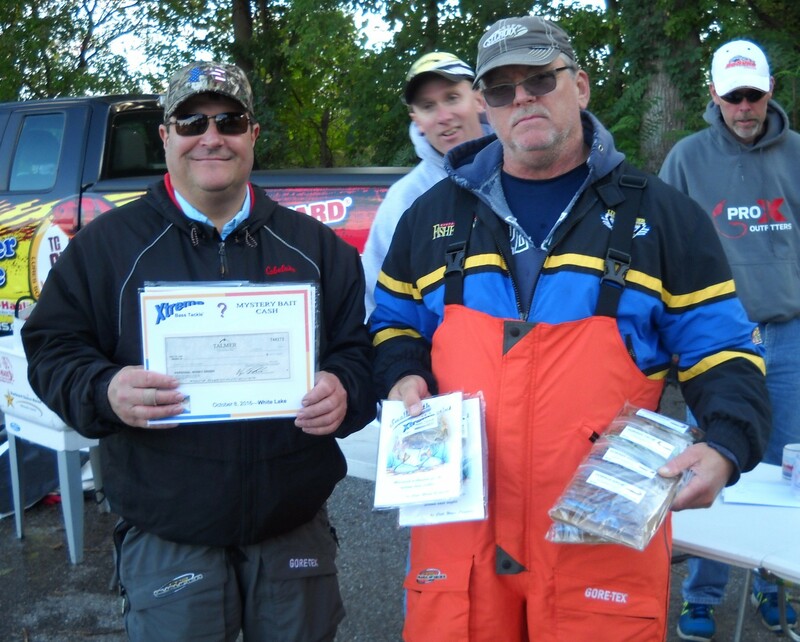 6th Place: The 2013 Season Champions and All-Time Money Winners, Kevin Fletcher and Greg Mangus, put together a 13.35 pound limit to win $500. 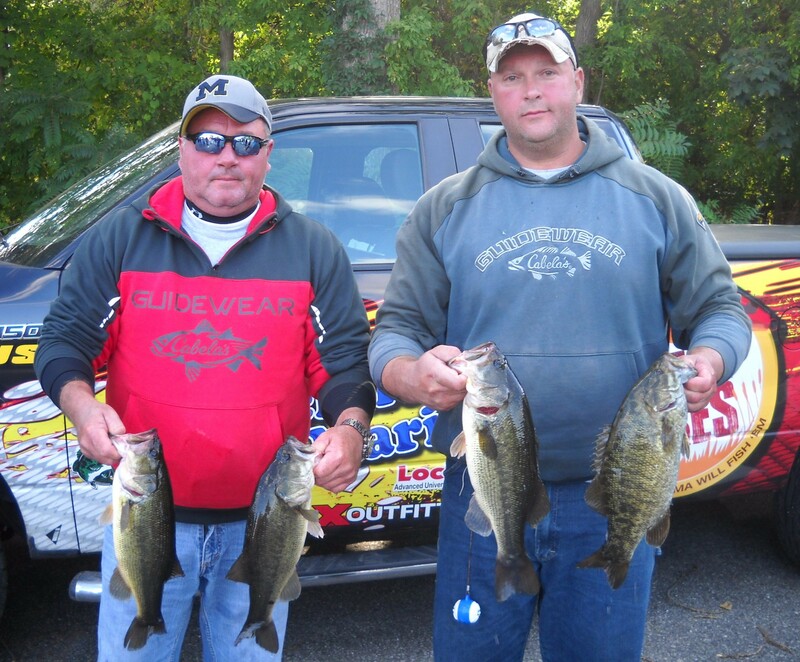 7th Place: A 13.19 pound limit by Stan Bebout and Rick Thatcher snatched them $400. 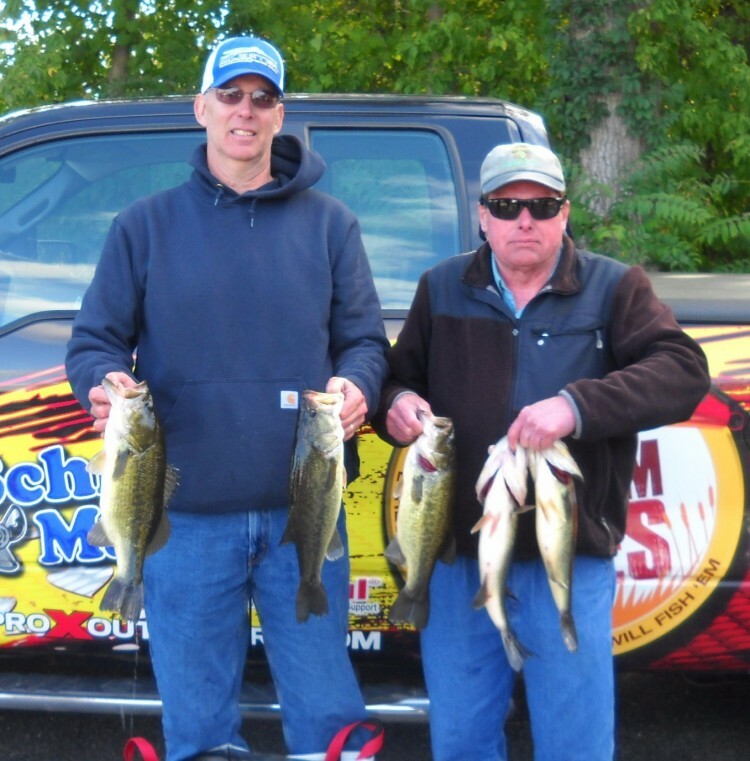 8th Place: Winners of two West Division tournaments (Lake Wawasee and Lake James), Jim Wheeler and Ray Smith, weighed a 13.03 pound limit to earn $300. 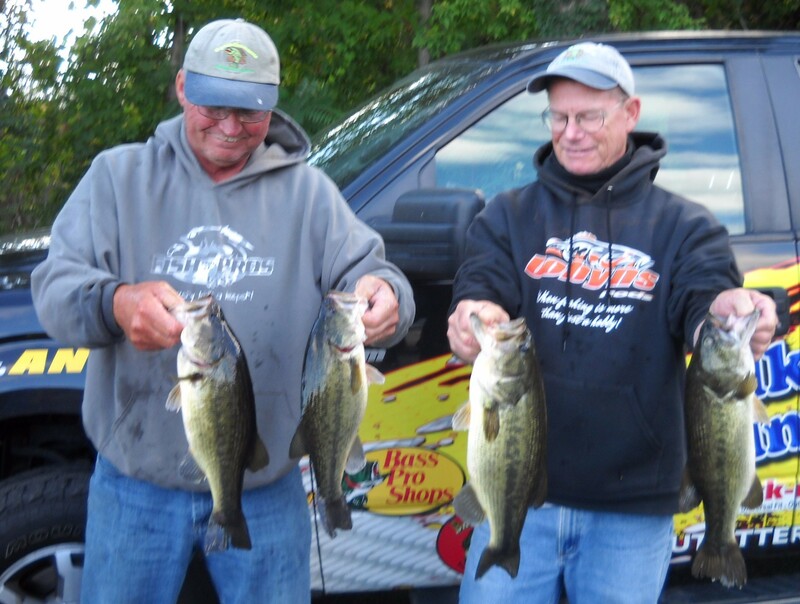 9th Place: 2015 Season and Classic Champions John Gipson, Jr., and Tom Noe put together a 12.58 pound limit to claim $180. A limit weighing 12.43 pounds by Mark Farver and Steve Kline won them a tackle pack provided by Rocky Brook Sinkers.